It’s not just learning facts, or even winning prizes. It’s about building confidence, too. 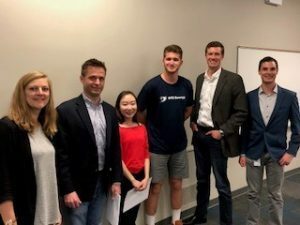 But all three resulted from the participation of some Eli Broad College of Business students in contests related to experiential learning programs this past spring where undergraduates teamed up to brainstorm with a couple of metro Detroit corporate heavyweights: Quicken Loans and DTE Energy. Broad students from sections of Marketing 355 in Spring 2018 and Business 190 from Fall 2017 swept top honors both in Quicken’s “E-ternship Program” competition and DTE’s “Energize Innovation” contest. The awards are nice, but the experience is better. 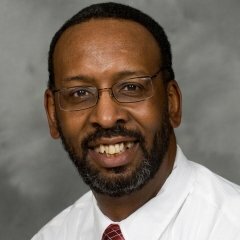 “It is one thing for them to learn terms, definitions, and concepts, but it is quite another for them to learn in their hearts that they can do something – especially when they have never done it before, and didn’t think they could in the beginning,” said Forrest “Sam” Carter, faculty director of the Burgess Institute for Entrepreneurship and Innovation and an associate professor in the Department of Marketing. Along with the experience, students got the chance to rub shoulders – and share ideas – with role models. Meanwhile, companies get a chance to conduct what is called adaptive execution, which relies on inexpensive ways to identify whether a particular strategy will fail or not, and if it fails, to learn valuable lessons from that failure, Carter said. “This project allowed these companies to test tactics relevant to their current marketing experiences and validate which ones had traction and to learn from those that did not have traction,” Carter said. Campus Commandos: students tested an onboarding strategy for the marketing firm to get large numbers of students to sign up at low cost but large scale. “Their results suggested the strategy was quite viable,” Carter said. Skillo: students tested a content marketing approach to attracting prospective customers to the Quicken Skillo training Web site. “Again, their results provided evidence that this approach had merit,” Carter said. 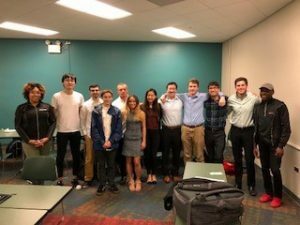 Rocket Fiber: students developed a database for a call list for Quicken Rocket Fiber’s sales force, as well as a strategy for the Internet provider to approach prospective clients, according to Carter. Meanwhile, for DTE, student participants designed, implemented, and marketed for an ideation contest, which included more than 100 student submissions from across campus. The participation of Broad students was rewarded with both class extra credit and Entrepreneurship and Innovation Experience credit. “DTE found five ideas that had not previously been thought of that they feel has great potential as value-adding products or services for their company,” Carter said. The project was also a leap of faith for the DTE team. 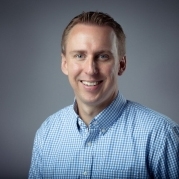 Eric Clinton, manager of electric marketing and new products and services development, and his team had never used such an “open innovation” approach to their ideation process. They found the experience to be an equally valuable learning opportunity, according to Carter. Quicken winners from Carter’s Marketing 355 class (in order of finish) were Dylan Clark, Grant Fortenbacker, Claire James, Trevor Joy, Nikita Patel, Griffin Romney, Trinity Smith, Courtney Sturza, and Harli Wood. Quicken winners – whose ideas were voted best by the company they worked with – from Szymusiak’s Business 190 class were Noah Fetterhoff, Dhruva Govil, Sam Hansen, Stephanie Hilts, Hanna Holmi, Devin Laporte, Armani Mckalpain, Edward Okuniewski, Abbie Reimel, Tabitha Ann Rose, Lyndsay Sharrer, Morgan Janelle Stinson, and Holly Taipala. DTE winners (also in order of finish) were Tianyue Yang, Taylor Stack, Angelos Bairactaris, Ken Buchanan, and Kelly Buchanan. His time at Michigan State University as a student is coming to a close yet, there's a bond Spartans all share for life.